We offer all the optical services you expect, but some extraordinary services and products only found at Expressions In Eyewear! For a truly unique set of glasses we can help design inlaid Swarovski crystals right into the front surface of the lenses. 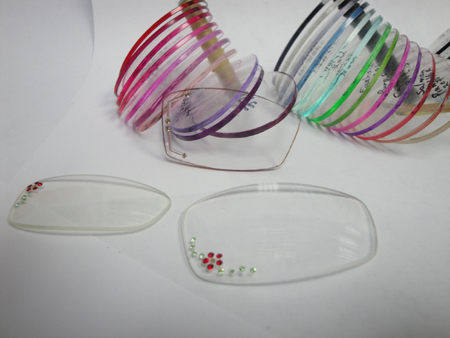 Unique fashion and utility lens tinting are also available; as well as a large assortment of edge colorings to complete that “Not-so-typical” pair of glasses. Remounting or resizing your existing lenses into a new frame? YES WE CAN! If your frames are damaged or worn out we can take your lenses and reshape, resize, even groove or drill-mount them into a rimless frame design. The prevalence of this skill has faded due to chain and large box corporate optical stores not hiring or training opticians to be opticians but simply order takers. An in-house lab is not a guarantee of quality or speed. Most in-house labs have the downfall of poorly trained staff incapable of mastering complex designs or High Rx needs. We at Expressions In Eyewear produce the highest quality eyewear possible, priding ourselves on adeptly filling complicated prescriptions. Unique lens to frame combinations, prescription accuracy and fit are our other areas of expertise. 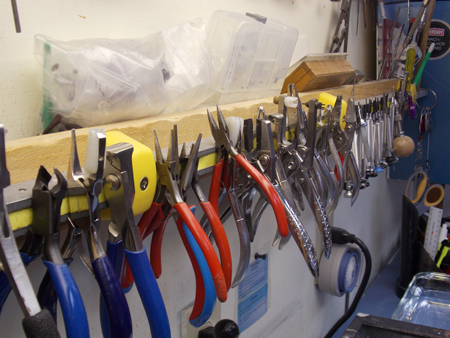 All repairs are done in-house with an emphasis on being able to repair what other stores can’t. Certain breakages and parts are irreparable and with these we have become inventive with temporary repairs to keep you seeing.